Here's one of the new online slots games from the brand behind Fluffy Favourites, Eyecon Gaming and enjoy playing it. The fuse is lit, and the scene is set for the most spectacular slots display you can imagine! On the 5th of November, 1865, Guy Fawkes put into motion his plot to bring down the British Houses of Parliament with gunpowder. His plan was foiled, though Brits still mark the day by celebrating Bonfire Night, setting off magnificent fireworks into the night sky. 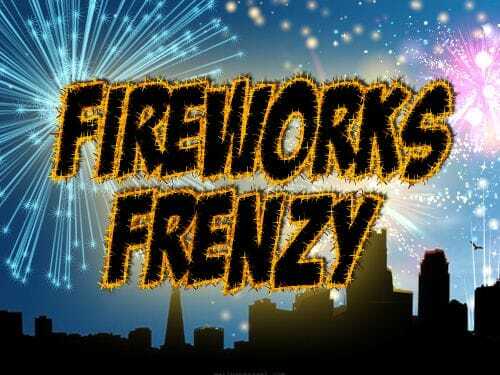 Playing Fireworks Frenzy, you’ll feel you might be gathered round a bonfire on a chilly November evening, looking up at a dazzling pyrotechnic display, without even having to venture out into the cold! Check out our entire list of game of casino now. This game is bold, bright and gets back to basics with a clean and simple interface. There are five reels, set against the atmospheric background of a dark, starry night sky, with a big crescent moon prominent in the top tight-hand corner. The bright colours of the firework symbols on the reels stand out against the dark backdrop. It truly is a display as they roll by, amongst them, pink chrysanthemum-style fireworks, yellow bursts of colour that resemble starbursts, and letters and numbers made from firework sparks. WILDS – Catherine wheel symbols substitute for all other symbols apart from SCATTERS. Should one appear in a win line, the prize is tripled. Watch as those prizes burst into existence right before your eyes! 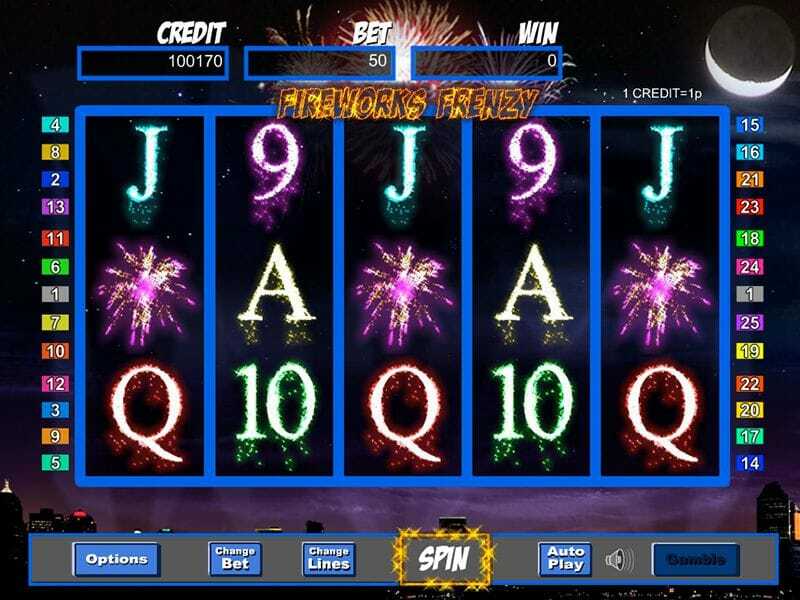 SCATTERS – 3, 4 or 5 firecracker SCATTER symbols on the reels trigger Free Spins. 3 symbols gives 10 Free Spins, 4 gives 15 Free Spins, and 5 gives 20 Free Spins. Free Spins can be re-triggered up to 15 times, meaning the first set can light the fuse for an impressive chain reaction. 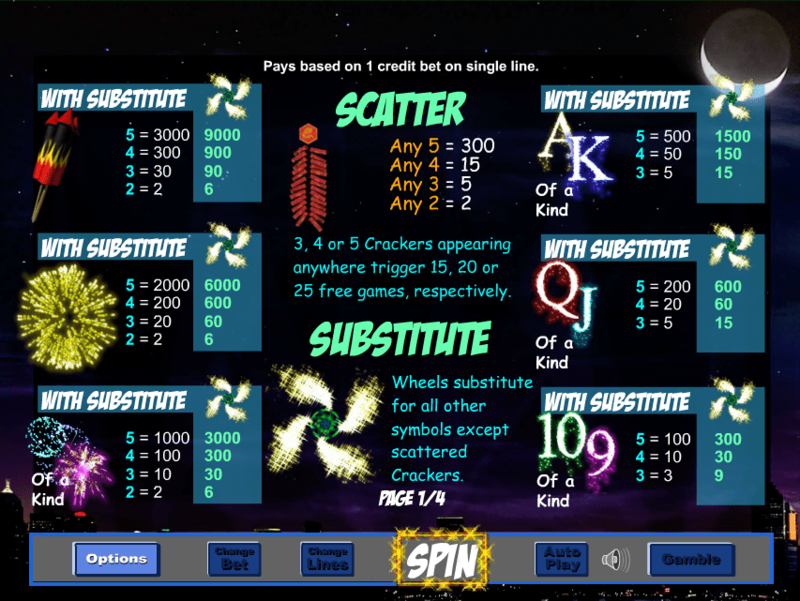 It’s easy to adjust your lines and bet, and to set up to 100 Autospins, making your game nicely customisable. If you’re simply popping in to wave a quick sparkler and have a toasted marshmallow, the game delivers, though if you’re hoping for a longer show, you can tweak the settings to your heart’s desire.